Report RSS	Only 2 Weeks to go! There is only 2 weeks to go before the Golden Spanner Mod of the Year Awards polls are closed and the Mod of the Year as choosen by the people is declared! Whilst I am not going to reveal who is presently leading, let me say its an extremely tight competition with plently of little known mods polling extremely well! 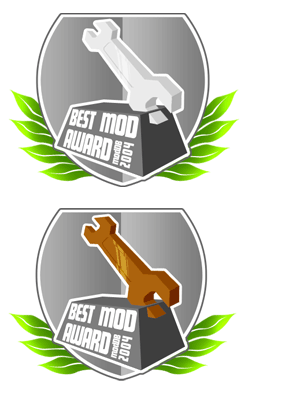 So if you want to give your mod the opportunity of walking award with an award or two, encourage your fans to vote! With EA and GamePanel on board there will even be the odd prize for the winning teams not to mentionion the pimpage and honour of winning this competition the first year it is run! So get to it, get voting and give your mod a chance! Want to give your mod the best chance of winning? Well then encourage your mods fan to come here and vote for it! To help you out we've put together a few promotional images your free to use and edit at will! I actually found myself wanting more votes, because I exhausted my supply pretty fast. Some good mods to check out are Forsaken, Wizard Wars, Doom 2 GoldenEye TC, etc. Just browse the database using your favourite genre as a search key, and find some that sound cool, read about them, then vote!